Grit Property Group, based out of Melbourne, Australia now offers an unmatched combination of deep industry experience, local market expertise and personalized attention to the vital area of property investment services and student accommodation. This double-edged strategic move will assist Sri Lankans in investing in lucrative properties and arranging accommodation for their children studying overseas. 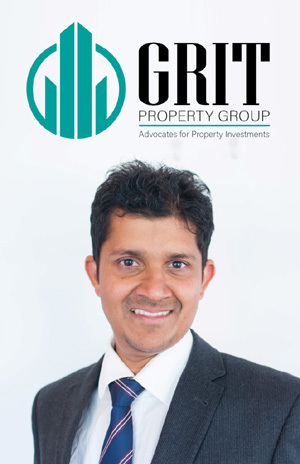 Founded by successful and forward-thinking entrepreneur Navin De Silva, who has a proven record of over eight years in the industry, Grit Property Group delivers proven solutions and exceptional service that adds value, enhances lifestyles and makes a difference every day for every resident and community it manages. The company has assisted hundreds of investors/parents all around the world and is focussed on providing these benefits to Sri Lanka too. Grit Property Group offers two main streams of business, namely; Student Settlement Program for students/parents and Australian Investment Properties for investors. Student settlement program focuses on student accommodation covering the various aspects of student settlements in Australia, including Airport pickups, Accommodation, Advisory services and logistics. Australian Economy is currently in it’s 26th year of continuous growth. It is expected to average annual GDP Growth of around 3% over the next 5 years. Australia consistently ranks as having one of the fastest growing populations in the developed world. Current Australian Population is 24.6 Million. Australia has one of the highest shares of foreign born nationals making up its population and immigrants will continue to represent the bulk of Australia’s population growth going forward. Director Grit Property Group Navin De Silva states, “The ever-growing reputation of purpose built student accommodation is Melbourne’s highest yielding property asset which has seen total investment in the sector increase consistently over the past few years. Our ultimate goal is to eliminate stress for parents and students when they arrive in Australia and get them settled in without a hassle.” He adds, “I strongly believe that this is a fantastic time for overseas investors to invest in Melbourne, especially at a time when there is a shortage of 23,000 houses per year.